The SEC rejected filings for Bitcoin ETFs in 2017 sighting price manipulation and lack of overseas regulations. If a Bitcoin ETF is approved, the market could start witnessing new capital streams. Bitcoin price has broken out of the rising wedge pattern. CBOE is not the only institution that has filed for Bitcoin ETF with the SEC; SolidX, as well as Gemini (Winklevoss twins), have also done the same. The SEC rejected other application last year due to price manipulation and the fact that most markets overseas are unregulated. Even countries like Japan still lack policies to govern the crypto market at the moment. However, the Japanese government has been making tremendous progress with the regulations and it is working on unifying regulations for the G20 group of countries. If a Bitcoin ETF is approved, the market could start witnessing new capital streams into the industry. The trading volumes are bound to increase and there will be ripple effects on the prices of digital assets across the board starting with Bitcoin. Bitcoin price has broken out of the rising wedge pattern and is currently trading below $6,500. The entire cryptocurrency market is bleeding at the moment and BTC/USD is down 2.9% on the day. 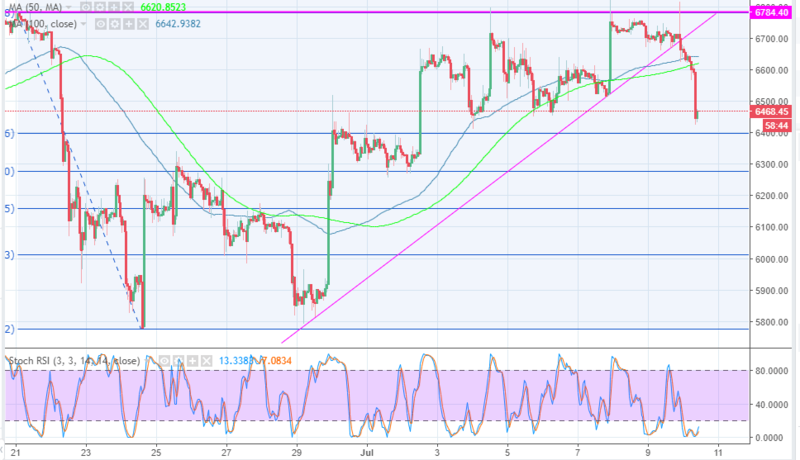 The support zones at $6,700 and $6,600 failed to hold ground, but the buyers entered above the stronger support at the 61.8% Fib retracement level with the last swing high of $6,784 and a low of $5,775 at $6,400. The trend is strongly bearish and Bitcoin is likely to settle in a bearish flag pattern with a short-term immediate support at $6,440.